I’ve never taken a cruise before so when my two friends asked if anyone would like to join them on their trip to the Bahamas, I strongly considered going with them. I asked my friends to see if anybody else wanted to come along, but no one seemed interested. I hesitated because I was also trying to save money, but eventually decided that it might be a good escape. Alex and I were only a month or two into our relationship when I proposed the idea of him coming with me. 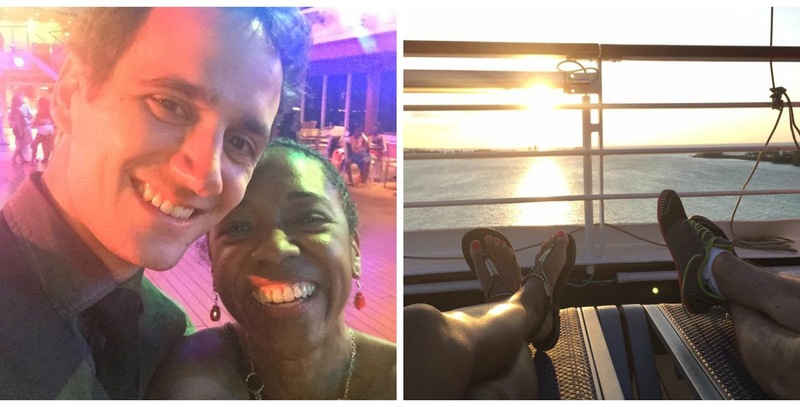 It was crazy to go off on this romantic trip to the Bahamas with a man I’d just met, but our courtship up until then had been speedy and crazy already and it still felt good. As nervous as I was about committing to a trip months down the line - I had to take a few inhalations before we booked the cruise and flights - I really wanted to experience this adventure with him. Meanwhile, he didn’t hesitate to say yes when I asked. In fact, he suggested that we add a leg to the trip since we’re both freelancers who can work from anywhere. Didn’t have to ask me twice. We decided to stick around Florida for four more days after the three-night cruise returned to Port Canaveral in Orlando. I always knew a cruise ship would be huge, but damn. 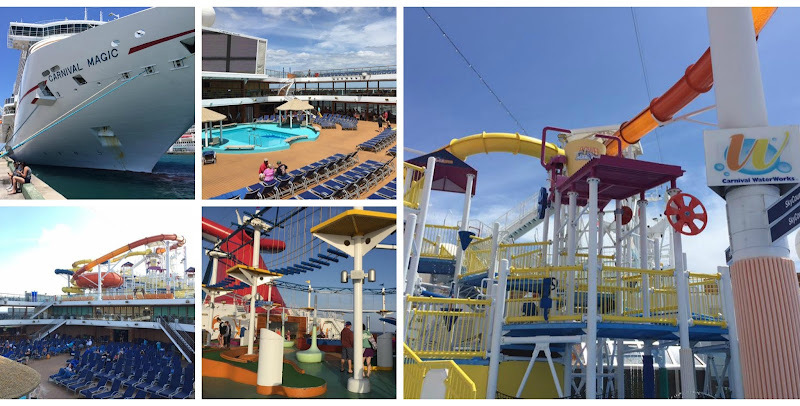 Carnival Magic has fifteen floors of cabin rooms, restaurants, clubs, bars, a waterpark, ropes course, pools, spa and fitness areas..you know, in case you want to work off all that food you were eating. And there was so much to eat. You could nosh 24/7 if you wanted to - and there was a good chunk of the population that did - and the amount of choices were beyond comprehension. Breakfast was a variety of eggs, grilled deliciousness, pancakes, waffles, sausages, bacon, fruits and veggies, cereals, breads, potatoes, etc. and etc. When lunchtime came around, platters of sandwiches, salads, hamburgers, soups, sautéed veggies, pasta, desserts appeared. I mean I could go on and on. A self-serve soft-serve ice cream machine was always on hand. It was right next to a burrito bar and a Guy Fieri hamburger joint, which was pretty damn good, I have to say. I just wish they weren’t so damn stingy with the fries. Everything else they give you heaps of, but fries?! Any who, the main dining area was buffet style: grab a plate and fill up as many times as you’d like. At the “fancier” sit-down restaurants on board, we were seated at a table and waited on by a server. Alex and I aren’t big eaters and seconds were needed at our dinner outings, but the waiters would let us know that the same gluttonous rules applied there. Once, we told our waiter that wouldn’t be having dessert because we didn’t want to be late meeting our friends for drinks afterwards. He looked flabbergasted. Another, told us to just order one of everything on the menu when we couldn’t decide on what treat to share. It’s been three months since we went on that trip and I still wonder why we didn’t feel like stuffing our faces more often. It was, after all, completely paid for by our booking. The whole situation just seemed so excessive. 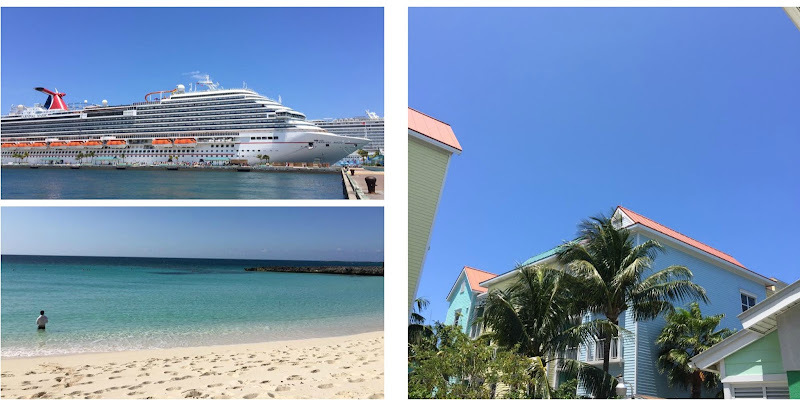 The cruise made a day-long stop in Nassau on its second day and Alex and I disembarked early for our Bahamian adventure. We didn’t feel like shelling out even more money for this trips so when the masses lined up for their tours at the port or hopped on a taxi to head to the beach, he and I walked two miles along the island’s coast. Downtown Nassau, which contains the wharf where cruise ships dock, was gritty and quiet on that Thursday morning. It almost reminded me of the city center in the Dominican Republic if it were completely devoid of the maddening traffic and crowds. It was good to see this side of Nassau and notice how the landscape changed as we walked closer to the resorts. 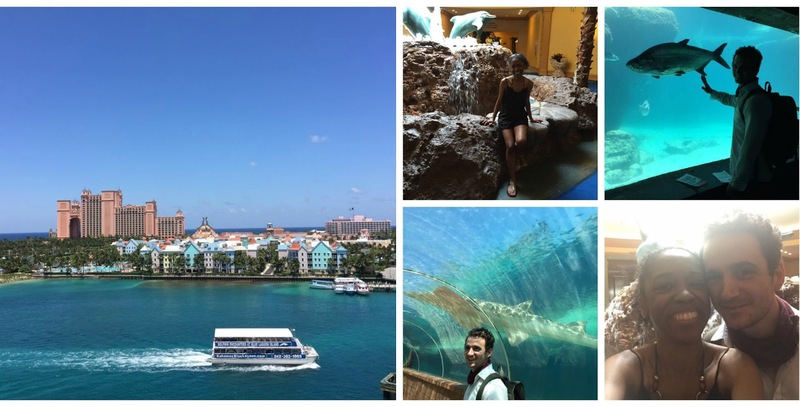 With no real plans or route to get to a free public beach, Alex and I decided to crash Atlantis Paradise Island Resort. We could spot the sprawling high-rise hotel in the distance as we crossed over the Sir Sidney Poitier Bridge onto Paradise Island. And beyond that, turquoise sea. The key was to act like we belonged there. Don’t look lost or confused. Hide your wrists so security can’t note that our guest bands are missing. Chat. Laugh! That last part wasn’t too hard to manage considering how silly we felt creeping around this resort as if we were staying there. As much as I craved a dip in any of its swimming pools, we couldn’t risk getting found out. When Alex glimpsed a sign pointing towards an aquarium of some sort, we decided to check it out instead of the rope bridge and lazy river we were initially heading towards. We suddenly found ourselves inside a clear tunnel surrounded by marine life swimming around us and above our heads. It was all worth it if only for the fright on Alex’s face when he turned and found a giant sawfish swooping up over him. We would’ve called that a win for the day, but we decided to push our luck even further and headed towards the resort’s beaches. Dodging security while walking along the shore was a breeze, but we probably needn’t have worried much because we kept spotting the blue towels from fellow cruise mates sunning on Paradise Beach. By this point, we’d already been walking for several hours without sitting down to rest. I really wanted to drop dead on the beach and relax, but Alex wanted to keep plowing through the sand to find a better spot. I was tired, but I’m so glad we continued our search because past that first beach and at the very end of Cove Beach, we found the white sand beach and beautiful waters we’d caught a glimpse of from the bridge earlier in the day. Best part: we practically had the whole stretch to ourselves. There was one other couple nearby, but the sea was all ours. The water was so clear and calm, you could see schools of little fishes trying to nibble at our legs, which was freaky as f so ran the hell out of there. Eventually we ventured back into the shark-infested waters to splash around and show off my swimming skills. Guys, after three months of swimming lessons, all I can manage to do is swim backwards. What the hell?! I laughed so hard that day, diving under the water, trying to propel myself somehow, hearing Alex laughing up above, and then jumping up for air and launching myself at him for teasing me during such a vulnerable time. He was right though, I couldn’t swim to save my life, but at least he was determined to teach me how. I couldn’t pass by Orlando without visiting a dear cousin I don’t get to see nearly enough. 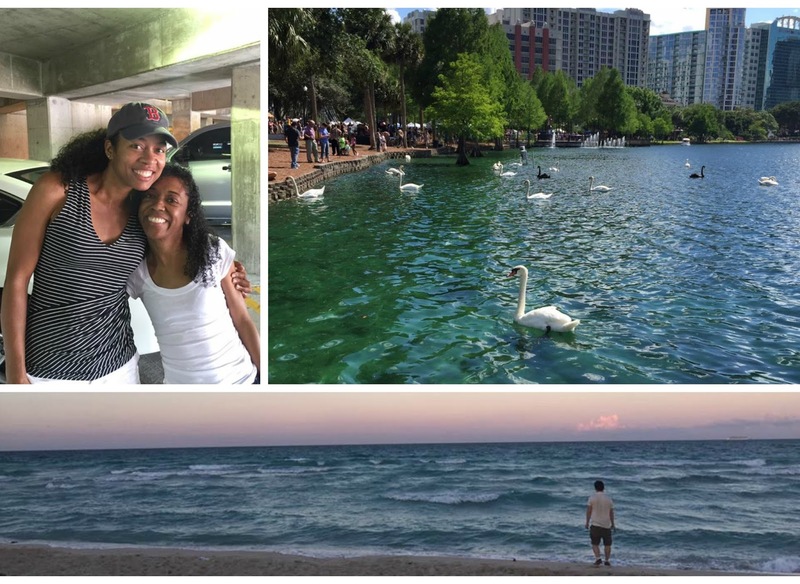 The visit was much too short, but the three of us had a fun time goofing around, exploring downtown Orlando during an Earth Day festival and catching up while watching TV and discussing the merits and pitfalls of online dating. Alex and I left for Miami Beach the following morning and aside from a stressful rental car experience, I have to say our first road trip was a success and we both walked away unscathed. I was really anxious leading up to it because of past history, but he was so calm and collected even when both our phones were glitching with directions, that it helped ease my worries that we’d find ourselves into a huge argument in the car. The next three days were spent going to the beach day and night (our Airbnb apartment was right across the street). The ocean was much choppier here, but I was able to make some progress on my swimming technique, and a sandbar allowed us to trek far into the water without going in too deep. We’d start our day with lunch at corner restaurant Sazón so I could get my fill of Cuban food and Alex could satisfy his coffee addiction with a café con leche so good he was sad to leave Miami and it behind. 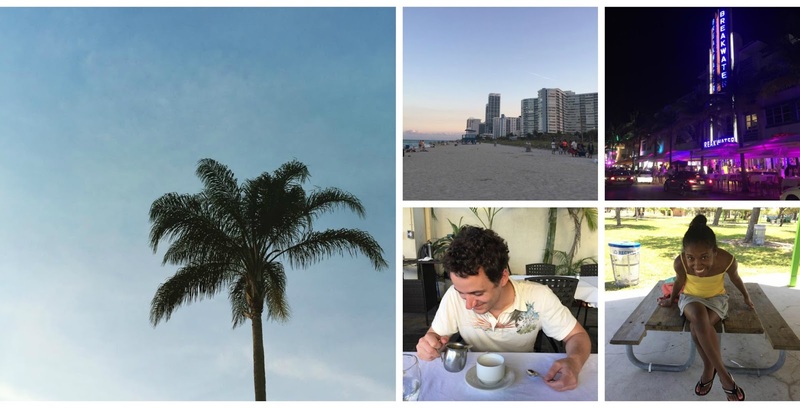 One night, he drove us into South Beach for dinner and our usual moonlit stroll to sit on the beach and chat. Sometimes we’d just sit there in silence, probably lost in our own thoughts, but happy to have each other’s quiet company. You can learn a lot from traveling with a partner, including how they handle stressful situations, running around from one activity to another in a foreign setting, socializing with strangers, and, most importantly, seeing your face for days on end. 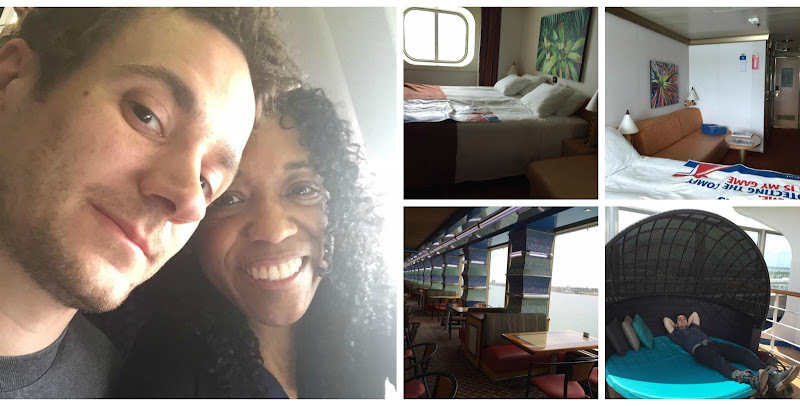 Those cabins on the cruise ship were bigger than I expected, but still very cozy, and we didn’t get on each other’s nerves. We respected one another’s need to slow down for some “me” time during the trip and compromise came easily because we wanted to make sure we were both having a good trip. If someone felt off, feelings were quickly validated, a discussion ensued, and we were able to kiss and move on with the day. My anxieties over whether this adventure was “too much too soon” subsided and I tried to leave behind feelings about the past or concerns about the future by being mindful about where I was at the moment - having the time of my life and getting in so much sunshine and beach time. And it was a cherry on top to get to know my partner better during all of this and share a new experience with him. How have your past trip with partners gone? And have you ever taken a cruise? This was my first and I think next time around I'd like to spend more time at a destination. This one was much too short! Hubby and I don't go away much. Mostly our outings are the kinds where we can come home again the same night. He doesn't do well in stressful situations though... I'm the one who can keep my head and deal with issues (not to mention, stop him from freaking out). That's not why we don't go away much though. We just both like to be able to sleep in our own bed after whatever outing we've had. I've never been on a cruise. I've been on a paddle boat in the ocean, and been on a river barge, but that's about as exciting as my boating experiences get. Well good thing you guys balance each other out so he doesn't fly off the edge without you. And I feel you on the home/bed front. After a string of travels years ago, I remember being so grateful to be in my own space again: sleeping in my bed without the need to run off sightseeing, eating cheap food from my own fridge, and being able to soak in my clean tub if I wanted to. It's the simple things, I guess. But even still, I need to leave New York City in order to come back and fall in love with it again. This February, we took the kids on a Disney Cruise. We ate so much and felt like it was the unhealthiest vacation ever. Next time if we want an all inclusive experience, we will probably do a land resort. At least it will probably have bigger swim pools for the kids to swim! The "Mickey Pool" on the Disney Cruise was literally just for soaking. I love that you guys have maintained your Disney tradition all these years. That company needs to repay you in some way for being such a loyal customer to them. I haven't seen much of the Disney Cruises recently, but I remember when I worked at Travel + Leisure there was a Disney Cruise that had an enclosed water slide/tube that jutted out beyond the side of the ship and back into a pool on the deck. It looked crazy! The view and the waters were amazing.